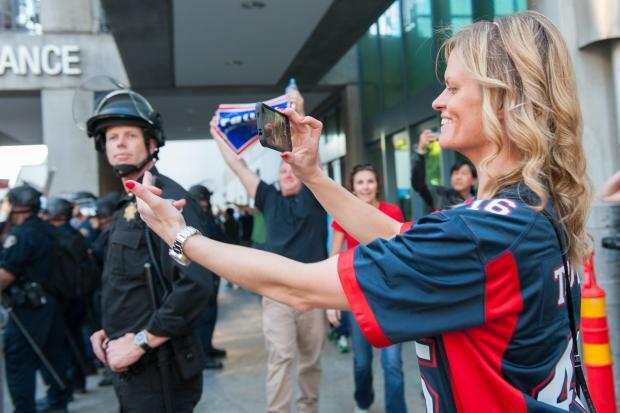 The woman who captured national attention Thursday night after she was egged at a Donald Trump rally – and then smiled about it – is asking for people to help oust the mayor of San Jose. Rachel Casey, identified by her Facebook posts, LinkedIn profile and by people who know her, posted one of at least two petitions to get Mayor Sam Liccardo to resign from his post. As of Monday, one petition, started by a man in Texas, had 3,600 supporters. Another petition, started by a man in Minnesota, also asks for the mayor’s resignation, and had more than 7,000 signatures by Monday morning. The mayor had criticized Trump for whipping up the nation into an antagonistic state, but also condemned protesters for getting violent – mostly by harming the Trump camp. Liccardo responded: "I’m not terribly persuaded by calls of resignation that are emanating from Texas or Minnesota. I serve at the pleasure of the residents of San Jose and am accountable to the residents of San Jose." Efforts to reach Casey, who lists herself as a physical therapist assistant and personal trainer from Florida who moved to the Bay Area, were not immediately successful on Monday. Her former company, Boca Orthopaedics and Sports Medicine said she no longer worked there. A message left at what appears to be her home or cell was unanswered. She didn’t immediately respond to a Facebook message request, which she saw, as she acknowleged two reporters trying to find her in her own post. But her image persists as the face of the violent Trump rally last week, where not only was she egged, but others were injured and Trump hats and American flags were burned. New video shot and produced by San Jose State University students shows the woman flipping off the crowd before someone smacks an egg - and a tomato - right at her face outside the Marriott Hotel, next to where Trump was speaking. Witnesses told NBC Bay Area that she was making anti-Mexican comments to the crowd before she was egged. But she was not treated well, either. Afterward, the video shows a young man, surrounded by supporters draped in Mexican flags, spitting at her. He was surrounded by other angry-looking young men, many of them who covered half their faces with black bandanas. The crowd was chanting "F--- Trump" repeatedly as she and her friends walked by. It's not clear who started the name calling and taunting, but it was clear that both sides participated in what turned out to be an ugly atmosphere. Matthew Marbry, who lives in Florida, told NBC Bay Area by phone that he knows Casey – she once dated his brother-in-law. He didn’t want to comment on her specifically, but doesn’t condone her actions if indeed she was making racist comments. Like Casey, he’s a Trump supporter, but believes immigrants should be able to come to the United States legally and make a better life for themselves.